Last Friday, just before the market imploded on the higher than expected hourly earnings print, we published a Bank of America note titled "Our Sell Signal Was Triggered On Jan 30, S&P 2686 Is Next" in which chief investment strategist Michael Hartnett explained why he was convinced that a drop as much as 12% was imminent in the coming 3 months. 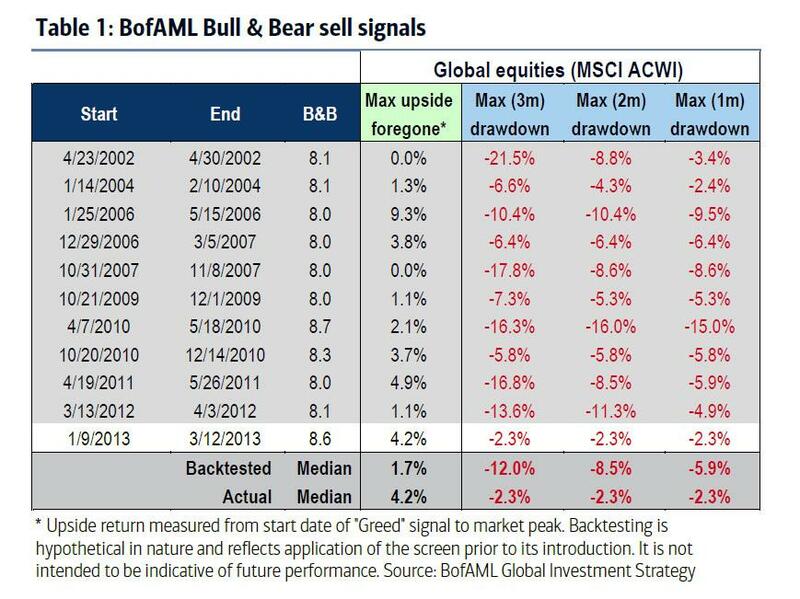 He pointed to a proprietary bank indicator that - when triggered - had correctly predicted a drop that averaged 12% over the coming weeks. As a result, he said that his immediate target for the S&P was 2686. With the S&P trading 100 points below his target just one week later, and 300 points below where it was just last Friday, we can now say that this indicator has been accurate on 12 out of 12 occasions. 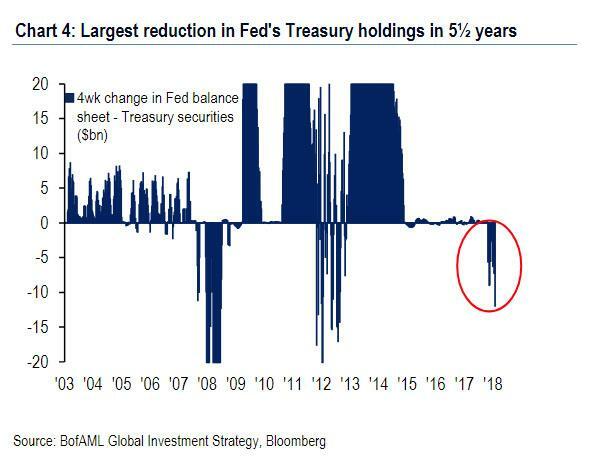 ... Hartnett writes that after 706 rate cuts, $12.1tn asset purchases by central banks, global interest rates @ lowest levels in 5000 years, "2018 marks end of era of maximum liquidity, maximum asset returns, minimal rates, minimal volatility, minimal spreads…end of era of Wall St inflation thanks to Main St deflation." 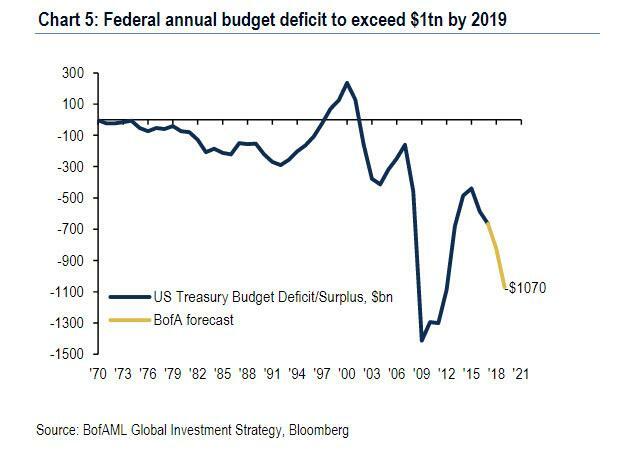 He also reiterates what we - and Moody's - said earlier, namely that 2018 is the year when the US deficit exceeds $1 trillion, something which is clearly not lost on the 10Y yield, and in turn is prompting selloffs across equities every time the 10Y yield approaches 3%. These three have all became euphorically priced, e.g. China tech sector on 9x book (vs China financials on 9x earnings), European HY bond yields < US Treasury yields; VIX & MOVE at 50-year lows; global equity market cap +$30 trillion since Feb 11th 2016 lows. The result is unfolding before our eyes, with daily 3-4% moves in the market, and nobody having any clue when the selling will stop. Structurally investors should study 2018 = 1966 analog…start of secular rise in inflation & interest rates caused S&P500 -16% in 1966, "Nifty 50-small cap value barbell" worked well (Chart 6) until inflation surge in 1969 caused massive shift from equities & bonds into commodities & cash (Chart 7). 3. leverage will no longer be in vogue. Correction chronology: XBT…UTIL…GT5…VIX…JNK…EMD…SPX; last Feb dominoes to fall should be DXY, CNY, SOX & EEM. Hartnett also knows how the correction/crash will end: with central bank intervention, or as he puts it: "markets stop panicking when central banks start panicking"
Humphrey-Hawkins (Feb' 28th) opportunity for Powell to signal old, cautious Fed back. Hartnett has two more notable observations. 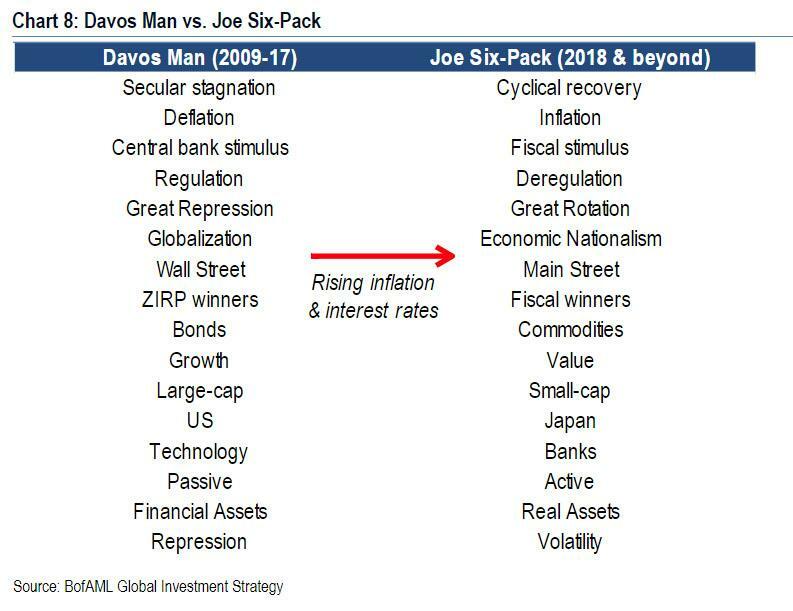 First, how to know if this is a correction or a bear market? 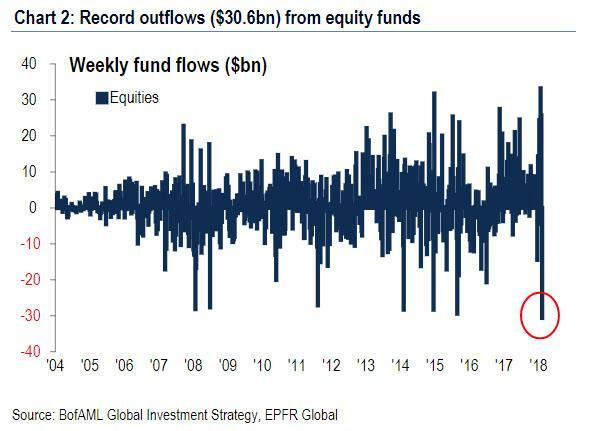 Look at the buybacks. best sign corporations do not see profit peak is resumption of strong corporate buybacks in coming weeks; profits key determinant as to whether this is a correction or a bear market. Putting this all together, Hartnett's reco is simple: use 2540 on the S&P and a 3% 10Y yield as "entry points in coming weeks."